Grease is a lubricant in a semi-solid state. 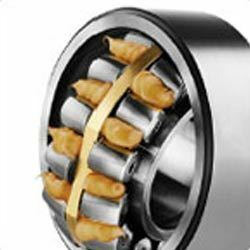 It is generally applied to those machinery parts where liquid lubricants would not stay and need to be applied only occasionally. It also works as a sealant to keep out moisture and other unwanted materials from the system. How is the base oil in grease important? We all know that lubricants can oxidize. But do you know that greases can oxidize too? That is because of the base oil that makes up the grease. Hydrocarbon base oil in grease, when oxidized, will produce carbonization leading to progressive hardening and crust formation. This can lead to substantial damage to the moving machine parts as well as permanently ruin the o-rings and seals. What is the Drop Point in grease? 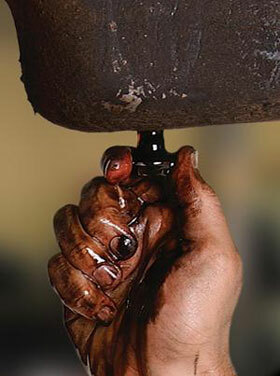 Generally, grease breaks down when subjected to temperatures that exceed its melting point or the Drop Point. This is that critical temperature where the gel structure of the grease breaks down and turns into liquid form. 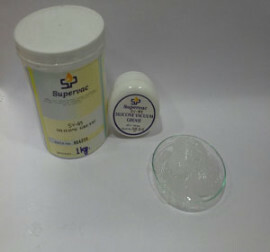 The base oil, thickener and the additives separate. This transformation is always irreversible. On cooling, it regains neither its consistency fully nor its former performance. When heated beyond its Drop point, grease softens, leaks and bleeds into the system. For vacuum systems this spells disaster. So does it mean that the Drop Point of a grease is determined by its base oil’s boiling point? Yes, primarily. 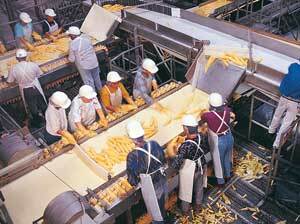 It also depends to an extent on the proportion and quality of the thickener used. How a particular grease will behave under extreme conditions like high pressure and temperature depends upon the properties of the base lubricant in it. Does the grease have a low temperature too? Yes, just like the melting or Drop point, grease has a low temperature too at which it stiffens. At this cold or low temperature grease becomes too hard to be of any use for the moving components. Instead of lubricating them, hardened grease can damage the o-rings and seals or the moving parts like bearings etc. by stiffening and jamming them. Again, the base oil determines the lowest temperature of grease. No, the difference in the components makes greases differ from one another. 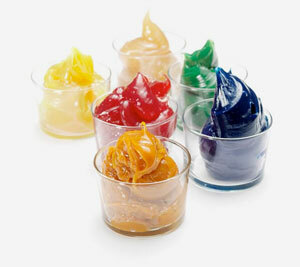 There are hydrocarbon greases as well as silicone greases. 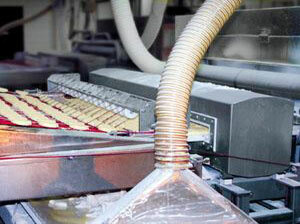 Food grade grease is required in machines where it is likely to come in contact with edible ingredients and so on. How does silicone grease differ from hydrocarbon grease? As the name suggests, the basic difference lies in the type of base oil in both. 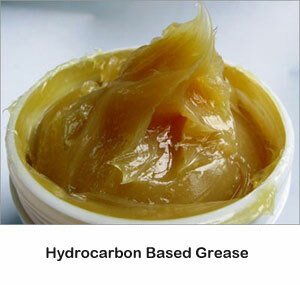 Hydrocarbon based greases are mineral oil based while silicone grease has silicone oil as the base oil. Hydrocarbon based grease is used primarily by the automotive industry and mechanisms requiring high frictional lubrication which makes use of grease’s thixotropic property. Silicone grease on the other hand is most suited for lubrication as well as a sealant because of its water resistant property. Unlike hydrocarbon based grease, silicone grease does not damage rubber seals and O-rings. Also the latter are very thermally stable; so they can withstand extreme working temperatures. What is special about Supervac Silicone Vacuum Grease- SV-G9? SV-G9 is made especially for the vacuum coating industry keeping in mind the parameters of the vacuum systems. Its base oil is good quality silicone vacuum oil with a temperature range of -25° C to 250° C.
SV-G9 lubricates and preserves the O-rings and seals and doesn’t let them swell or soften up with heat. It contains no additives. Because of this, no unwanted vapors are released into the vacuum chamber that can adhere to the substrate as impurities. It is stiffer than normal silicone greases; hence, even in very high temperatures, it remains non-runny and maintains its consistency. It’s an excellent water-proof sealant for the joints which keeps out the moisture from the system; so, is a must-have for all the vacuum systems. It has very good tackiness so it adheres to the surface sealing the vacuum. It has extremely low vapor pressure and hence it is extremely suitable for vacuum applications. It is resistant to attack of most acids, alklies and water. Formulated from high quality silicone vacuum oil as the base oil, SV-G9 is ideal for the vacuum coating industry. What’s more, SV-G9 is very competitively priced. It comes in the packing of 100g and 1 kg. 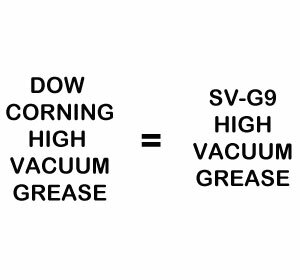 SV-G9 is exact equivalent of Dow vacuum grease and exhibits all the qualities of the latter minus the high cost. Vacuum coaters, world over, are using this product with utmost satisfaction.